We’re delighted to be working alongside the team at Essex & Herts Air Ambulance Trust (EHAAT) – helping them to find outstanding medical professionals to join their invaluable service. 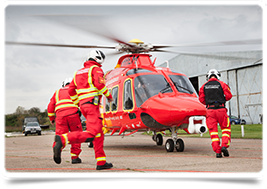 EHAAT’s aim is to save lives, reduce or prevent disability, or suffering from critical illness and injury, through delivery of a first-class pre-hospital emergency medical service to the residents of Essex, Hertfordshire, and surrounding areas. Every year EHAAT are called to over 1,000 life-threatening incidents. They are committed to recruiting doctors who demonstrate behaviours that align to their core values – passionate, professional, dedicated, innovative, and trustworthy. Doctors from all specialities will be considered. A higher postgraduate diploma (Postgraduate Fellowship or equivalent in your area) and 5 years’ speciality postgraduate experience are considered essential. A position with EHAAT is a unique opportunity to gain experience and expertise in both rural and urban pre-hospital care. These posts provide exceptional training supervision and clinical exposure in a variety of challenging locations and scenarios. If these amazing opportunities sound like a challenge you’d be interested in, please don’t hesitate to give us a call to find out more.